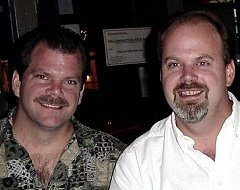 Greg Hupé (left) and Adam Hupé Asteroid Cafe in Seattle 2002. LunarRock.com was originaly built in 2001 to showcase one particular meteorite from the moon, Northwest Africa 482 (NWA 482). My brother, Adam, and I wanted to share the story so the site was created as a vehicle in which to deliver the history behind its time in space and to chronicle its terrestrial residence on Earth before being discovered by nomadic Berbers in Northwest Africa and its eventual purchase and distribution to a dedicated group of investors. The site also hosted scientific findings and a gallery of images. It worked out very well for my brother, Adam and I as we invested in nearly half of the available positions which enabled us to receive the 312 gram main mass. It immediately became the ‘Crown Jewel’ of The Hupé Collection which began in the mid 90s. Soon after our success with the recovery of NWA 482, Adam and I struck out on our own and started buying hundreds of kilos of suspect meteorites from Morocco, sometimes flying there personally to pick them out. The beginning offered mostly ordinary chondrites, occasional achondrites and many terrestrial stones. The slow beginning did not deter us and we were motivated by our closest scientists and friends, Drs. Tony Irving and Scott Kuehner from the Univerity of Washington in Seattle. Early on, Tony presented us with a lofty goal in the summer of 2001, motivating us to find (or purchase) a new planetary meteorite. Northwest Africa 482 lunar meteorite. Drs. 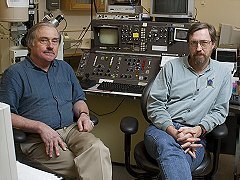 Tony Irving and Scott Kuehner at UW microprobe laboratory. our first Martian meteorite discovery! These would later be assigned the designation, Northwest Africa 1110. Within a few months of analysis, it became apparent that this new discovery was likely paired to one that a French team had been analyzing just days before ours was sent to the laboratory. We felt a little down by missing the chance to ‘be first’ by only a few days. This emboldened us further and we started to buy even more material from the Sahara desert. very first planetary meteorite that had never been discovered before. It was another Martian meteorite which has since been named, Northwest Africa 1195. We realized the dream in a relatively short period of time! 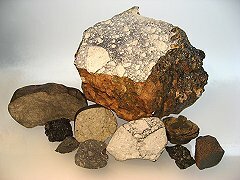 most often being rewarded with many new types of meteorites, a lot of beautiful ordinary ones and occasional Earth rocks. When taking into account our persistence, dedication and risk taking, our efforts were rewarded many times over with nearly two dozen new meteorites from the Moon and Mars! Grouping of some planetary masses. meteorite community. 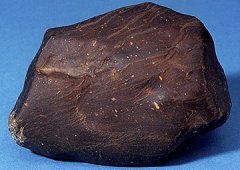 I wanted a new web site so that collectors and scientists could enjoy viewing the images and reading the many scientific papers highlighting these special meteorites. I am honored and privileged to present to you the new and improved... Lunar Rock web site!